An in-depth look at the experience of the civilian life of Britain throughout the four momentous years of World War 1, including volunteering and conscription, women's changing roles, shortages, food queues, rationing, ‘standard' clothes, air-raids and everyday life, all illustrated by contemporary artefacts, photographs and illustrations. The armed forces had first call on men, food, and material, so shortages hit the civilian population hardest; replacement labour was found in women, who began to take on work previously the reserve of men; in the factories, transport, commerce, and agriculture. Food remained a problem; shortages led to food queues, leading to increasing Government control and eventually rationing. Civilians were also hit by shortages of petrol and clothing, leading to petrol rationing, gas-cars, and ‘standard' cloth. There were also more immediate dangers; raids by German ships on coastal towns, and air raids throughout the country by Zeppelins, and later, aeroplanes. 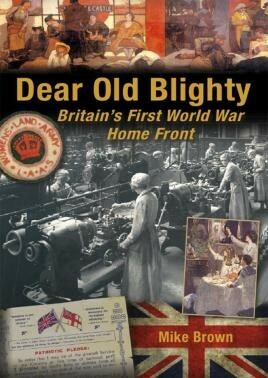 In ‘Dear Old Blighty', Mike Brown looks in depth at the experience of the civilians, men, women and children, of Britain throughout those four momentous years. This terrific book tells the story of the Home Front during the years of the First World War - beautiful photographs and illustrations make this a must-read for anyone interested in the social history aspect of the conflict. Overall its a feel-good book despite the fact that its based on World War One. Dear Old Blighty as we nostalgically want to remember it. Worth buying to give to an old uncle for a birthday gift or as i mentioned before for anyone taking their GCSE's.